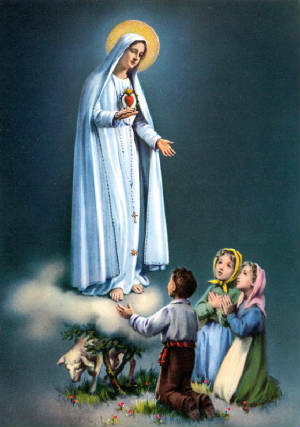 Our Lady of Fatima appeared to three children on October 13, 1917 in Fatima, Portugal. At that time, she gave three "Secrets" or messages, two of which have already been revealed. The third was "revealed" by the Vatican, although there are those who do not believe it is the entire secret. Our Lady asked that the last Secret be revealed either on Lucy's death--Lucy died this year in April--or in 1960, whichever came first. However, 1960 came and went, and Lucy's death came and went, and the Catholic Church has not changed its published version of the secret. I read an article that said that the Pope at the time of the apparations read the Third Secret and wept. He decided not to reveal its contents because they were too disturbing. However, the contents that are purported to be the Third Secret don't seem to me to be bad or frightening enough to cause a pope to cry and to disobey the mandates of Our Lady. Several people, however, including Portuguese translators, claim to have seen and read the (real) letter containing the Secret. Here is the prophesy as described by Art Bell on his show "Coast to Coast AM" on May 14, 1998 at 10:48 PM (P.T. ), two years almost to the day before the Vatican announcement. I add my own cautionary statement to his, although, as he admits, I too have a sense of authenticity about this. I have divided the paragraphs and added my own annotations here and there, in brackets. Remember, this prophecy was made more than 80 years ago. "A great plague will befall mankind. "Nowhere in the world will there be order, and Satan will rule the highest places, determining the way of things. "He [Satan] will succeed in seducing the spirits of the great scientists who invent arms with which it will be possible to destroy a large part of humanity in a few minutes [Nuclear weapons]. Satan will have his power, the powerful who command the people and who will incite them to produce enormous quantities of arms ["Axis of Evil! We must bomb Iraq!"]. "God will punish man more thoroughly than with the flood. There will come the time of all times, and the end of all ends. The great and powerful will perish together with the small and weak. "One great war will erupt in the second half of the 20th century [Remember that the U.S. first started fighting with Iraq in the 1990s]. Fire and smoke will fall from the sky. The waters of the oceans will change into steam, and the steam will rise and overflow everything. The waters of the ocean will become mist. Millions and millions of people will die from hour to hour. Whoever remains alive will envy the dead. Everywhere one turns one's glance there is going to be anguish and misery, ruins in every country. "At the last, those who survive will at every chance newly proclaim God and His Glory, and they will serve Him as when the world was not so perverted." A holy card depicting Our Lady of Fatima. "After the two parts which I have already explained, at the left of Our Lady and a little above, we saw an Angel with a flaming sword in his left hand; flashing, it gave out flames that looked as though they would set the world on fire; but they died out in contact with the splendor that Our Lady radiated towards him from her right hand: pointing to the earth with his right hand, the Angel cried out in a loud voice: 'Penance, Penance, Penance!'. And we saw in an immense light that is God: 'something similar to how people appear in a mirror when they pass in front of it' a Bishop dressed in White 'we had the impression that it was the Holy Father'. Other Bishops, Priests, men and women Religious going up a steep mountain, at the top of which there was a big Cross of rough-hewn trunks as of a cork-tree with the bark; before reaching there the Holy Father passed through a big city half in ruins and half trembling with halting step, afflicted with pain and sorrow, he prayed for the souls of the corpses he met on his way; having reached the top of the mountain, on his knees at the foot of the big Cross he was killed by a group of soldiers who fired bullets and arrows at him, and in the same way there died one after another the other Bishops, Priests, men and women Religious, and various lay people of different ranks and positions. Beneath the two arms of the Cross there were two Angels each with a crystal aspersorium in his hand, in which they gathered up the blood of the Martyrs and with it sprinkled the souls that were making their way to God."